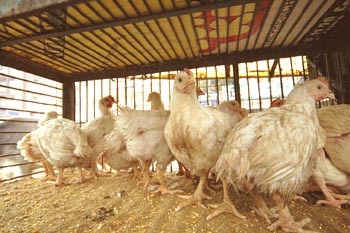 It is not just bird flu that has made chicken eating dangerous to your health. Read on to discover a secret that the poultry industry has hidden for a long time. n the dictionary ‘arsenic’ is synonymous with ‘poison’. It is considered the king of poisons. It is a metallic element used in rat poison, weed killer and in manufacturing glass. And, each time you eat chicken, you eat arsenic too. In 1944 Roxarsone—4-hydroxy-3-nitrobenzenearsonic acid now also known as 3 Nitro , Ristat or Renosal— was invented and allowed by the US Government to be fed to factory raised chickens. This is an arsenic-based additive which the poultry industry uses to increase weight gain, kills stomach parasites, improve the color of chicken meat and rear bigger breasted birds. This was taken up by producers all over the world. No studies were done for 40 years to see the effect of eating such chicken or its environmental impacts. In the 80s , when the European Union did the first tests, they banned arsenic in chicken feed immediately. However, it is still being fed to chickens in the rest of the world. While eating a lot of arsenic kills immediately , small amounts over a period of time , according to the Environmental Protection Agency can cause bladder, lung, kidney and colon cancer. It adversely affects the immune, neurological and endocrine systems. Low-level exposure can lead to partial paralysis and diabetes and a decline in brain functions. Physical contact with arsenic thickens skin initially, gradually decreasing blood flow to the heart. "None of this was known in the 1950s when arsenics were first approved for use in poultry," say toxicologists at the premier medical university Johns Hopkins University School of Public Health. Millions of pounds of roxarsone are mixed in chicken feed every year. The poultry industry, which makes more money for fatter chickens, has kept insisting that none of the arsenic stays in the chicken and therefore cannot be dangerous to humans. But recent studies have shown that a percentage of this arsenic stays in the chicken tissue and the rest is excreted in urine and chicken litter. Consumers cannot taste the arsenic as it is odourless and flavorless. According to the Environmental Protection Agency , just 10 ppb ( parts per billion ) in tap water raises the percentage of cancer in people to one in 2000. But the arsenic allowed in chicken is between 500 and 2000 ppb per billion and this standard , set in 1945 has still not been revised! Average chicken eaters may ingest 21 to 31 µg of arsenic everyday, which is much higher than the tolerable daily intake recommended by the World Health Organization. In 2004 studies done by the Food Safety and Inspection Service estimated the concentration of arsenic in live young chickens at 390 ppb. The Institute for Agriculture and Trade Policy tested chicken from supermarkets.Fifty-five percent of the samples of raw chicken contained arsenic ranging from 1.6 to 21.2 ppb going upto 222 ppb arsenic. A study in Environmental Health Perspectives in 2006 say that a typical chicken eating adult may ingest 3.62 to 5.24 micrograms of inorganic arsenic daily . Department of Agriculture, Food safety and Information Service says that , a person eating chicken daily will be ingesting between 21 to 31 micrograms of inorganic arsenic daily. The WHO standards of 1983 say the tolerable limit of arsenic cannot be more than 14 micrograms per kilo of body weight per week. In a paper published by the WHO in 2006 called The Burden of Foodborne Chemicals , the author writes that the average arsenic from food ranges from 15 milligrammes a day for Canadian children to 291 milligrams a day for adults in purely meat eating areas of Spain. There are two types of arsenic : organic and inorganic. Organic arsenic is less harmful directly. However, it turns inorganic in the presence of bacteria and becomes a killer. The chicken industry insists that roxarsone contains organic arsenic. However studies done by the Department of Chemical and Environmental Engineering in 2006 and by Partha Basu of the University of Duquesne University show that roxarsone arsenic becomes inorganic in less than 10 days. This is extremely dangerous , not just to the chicken eater who eats the inorganic arsenic in the bird meat but to everyone around. The magnitude of the health hazard can easily be gauged from the fact that , roxarsone, that is put in feed can degrade by mold and moisture into inorganic arsenic called trimethylarsine which is 2000 times more toxic than carbon monoxide. This chicken feed arsenic ends up not just in chicken meat . It is as dangerous to anyone eating cereals and vegetables or drinking water near poultries. One chicken excretes about 150 milligrams of roxarsone in a 42 day growth period and thousands of tons of inorganic arsenic in chicken litter is made into fertilizer and used in crop raising fields as well as in home gardens. Sunlight breaks down the compound further and it seeps into ground water. In research by the U.S. Department of Agriculture, the team found inorganic arsenic in the soils and aquifer sediments as well as in streams receiving runoff. A group from Johns Hopkins' also analyzed arsenic in tap water in areas where the most chicken manure is spread. It found higher levels of arsenic in areas where chicken litter is spread on fields and lower levels in areas where chicken manure is not spread. They found arsenic in all the drinking wells in excess of the legally allowed standard. The citizens of one town of Arkansas where the cancer rate is much higher than the national average , and which is in the centre of the poultry belt have sued Roxarsone for millions, blaming their health problems on the arsenic. Imagine what we are doing to ourselves by putting millions of pounds of poultry litter or waste contaminated with arsenic into the food chain. Around 90 percent currently is applied to fields and cropland as “fertilizer.” This litter used as nitrogen-containing fertilizer is routinely applied at a rate of between 1 and 2 metric tons per hectare. If a 100-hectare field was fertilized at 2 metric tons per hectare, about 10 kg of arsenic would be introduced to the environment . In India there are no regulations controlling the amount of arsenic in manure applications. And while each poultry uses roxarsone, no studies have been done on the arsenic in Indian chicken. The instructions on the cover of the chemical say that it is to be stopped 7 days before killing the bird. No one has even read the instructions. Roxarsone does not just impact the eater, but the farmlands, the water, animals and birds. Can birds survive arsenic ? No. Imagine a child walking across a fertilized field barefoot. Imagine drinking from a well with arsenic in it. Inevitably, arsenic finds its way into the rivers, stream and crops that are consumed by humans. Another study found arsenic in home garden fertilizer sold at lawn and garden stores, raising the risk that backyard gardeners will be exposed. Via waste incinerators, it finds its way into the air you breathe. Poultry litter is fed to cattle and pigs – in America legally and here , illegally. Which means that pig meat and cattle meat both have arsenic in them. In view of its known toxicity and its impact on all health, the practice of feeding chickens seems bizarre. If the chickens of the EU do not get fed it from 1999 onwards because Europe has banned it , if the largest poultry producer in the U.S., Tyson Foods, has stopped adding arsenic compounds to chicken feed why should we still be using it ? The Government has to ban arsenic in feed and it is for you to make them. And in the mean time , stop eating chicken.